Since 1971 Bereila is the specialist-manufacturere of sauce dispensers for Horeca, fastfood restaurants and foodservice companies. The systems for hot and cold sauces and condiments are of a superior quality and durability. Bereila dispensers and systems are easy to operate, easy to clean and easy to maintain. Bereila offers manually operated and automatic dispensing systems, as well as specific devices. In addition to a wide range of catalogue products, Bereila is specialized in developing and manufacturing customized dispensing solutions. Bereila has its own R&D Department and is proud to count a substantial number of renowned European foodservice companies amongst its customers. Our customers require sustainable solutions that are easy to operate and maintain and meet all the relevant hygiene requirements. We believe that sustainable and efficient kitchen technology contributes to a better kind of enterprise. Bereila provides a contribution to your business by developing innovative and user-friendly dispensers and fast-food solutions. 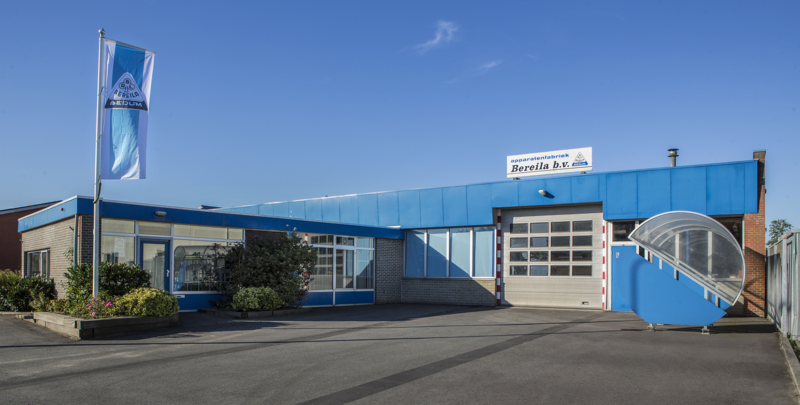 Bereila was founded in 1950 by Messrs Berghuis, Reineking and Laanstra. These three men, each of them with a technical background, joined forces. They decided to focus on developing mixed lubrication devices, as the exact dosage of lubrication oil per every single litre of fuel had proven to be a practical problem. Their invention was innovative at the time and the men succeeded in acquiring a number of patents. Thousands of mixed lubrication devices and related oil bars found their way to oil companies, oil traders, car and bicycle businesses. At many petrol stations you could find a “Bereila”, which had become a generic name for “mixed lubrication device”. In the 1960s the demand for powder-based fries equipment arose. Bereila successfully developed different types of powder fries equipment and, again, the company acquired several patents. Many powder fries machines were manufactured and this created a solid position in the food-processing industry. The oil crisis of the 1970s produced a serious decrease in the demand for mixed lubrication devices and the company decided to change its strategy. In 1971 Bereila started to specialize in dispensing systems. In addition to the original “Bereila Sauzenbar” many different dispensing systems and devices have been developed for use in restaurants and fast-food outlets. Bereila became a leader in terms of product quality, efficiency, sustainability and product innovation. To this day Bereila works for many leading foodservice companies and various other customers in the Netherlands and abroad.